Temperatures are cooling down and the leaves are beginning to change. 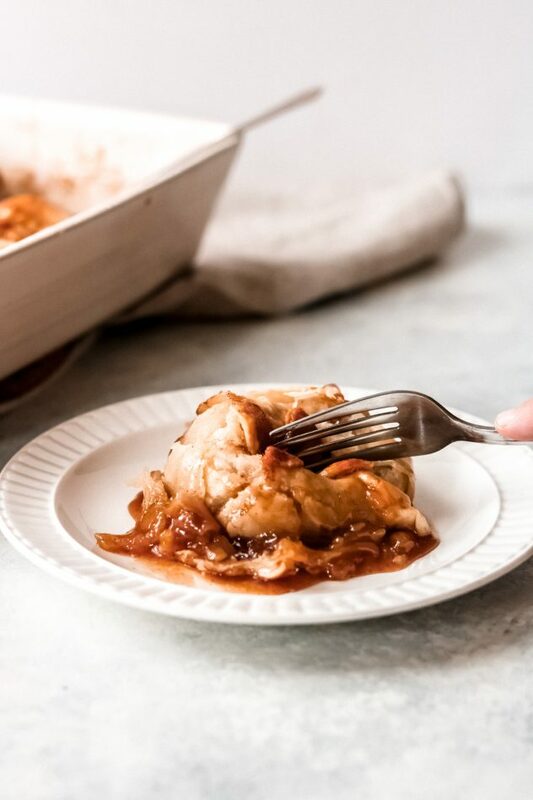 It’s the perfect season to bake up a batch of these baked apple dumplings and invite your friends and family over for a warm and cozy treat. I’ll be honest, this was my first time making baked apple dumplings. Want to know why? It’s because I always thought they were too complicated and “difficult” to make so I avoided them. As I’ve become more adventurous in the kitchen, I decided it was time to try my hand at baked apple dumplings. The verdict is…they are actually fairly easy to make! For this recipe, and for your first attempt, I suggest using store-bought pie crust dough. Now, if you’re 100 percent comfortable making your own pie crust from scratch, feel free to use your own recipe. However, if this is completely new to you, I would make that part of the recipe easy by using store-bought pie crust. Once the apples are peeled and cored, it’s just a matter of adding a little extra cinnamon and sugar then wrapping these beauties up with pie crust. Once they’re all wrapped up with the pie crust, you’ll pour the sauce over the apples and bake them. The sauce is a simple sauce made with brown sugar, cinnamon, water, and butter. You’ll melt the sauce while you’re peeling and coring the apples, then pour it over the apples once they’re in the baking dish. 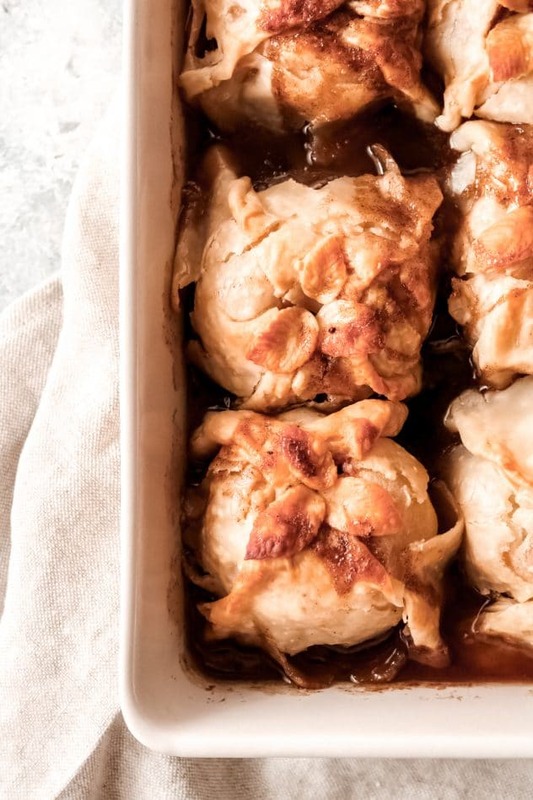 These baked apple dumplings smell absolutely amazing while baking. Once they’re finished, enjoy the buttery soft baked apple surrounded by the flaky golden pie crust. Don’t forget to add some extra sauce to your plate, too! BONUS!! I’ve teamed up with some of my foodie friends to share with you even more fall fruit recipes to love on! 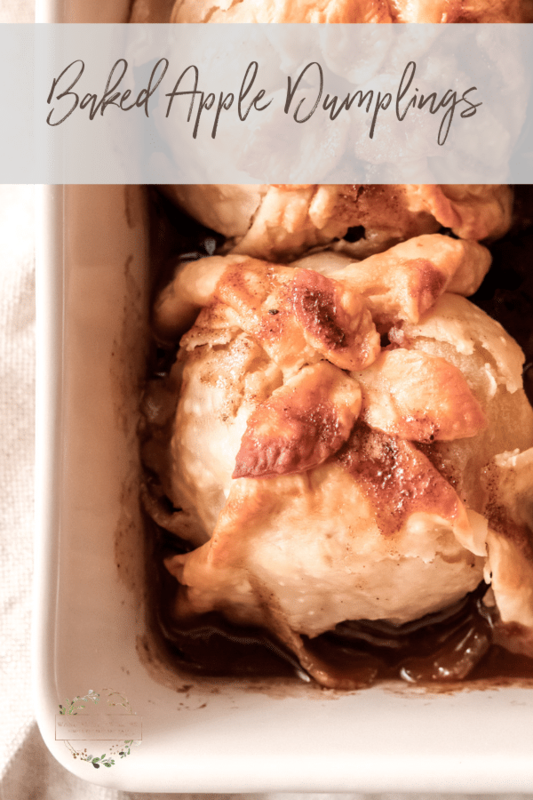 These baked apple dumplings are the perfect fall treat and they’ll have your house smelling warm and cozy. Remove pie crust from the package. 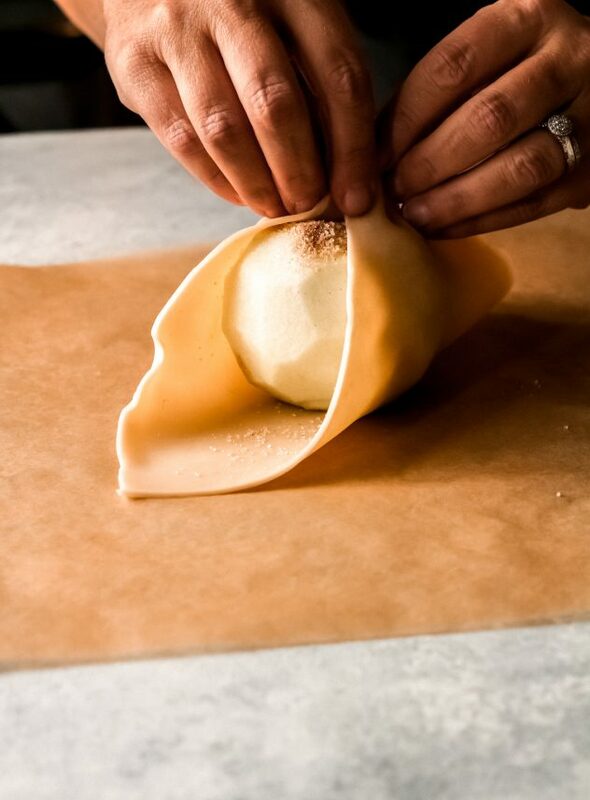 Using a rolling pin, roll the corners of the pie crust out until the dough forms a large square. Cut the square into four equal squares. Continue the same process with the second pie crust. In a small bowl, combine 1/3 cup granulated sugar and 1/2 tsp cinnamon. Mix to combine and set aside. 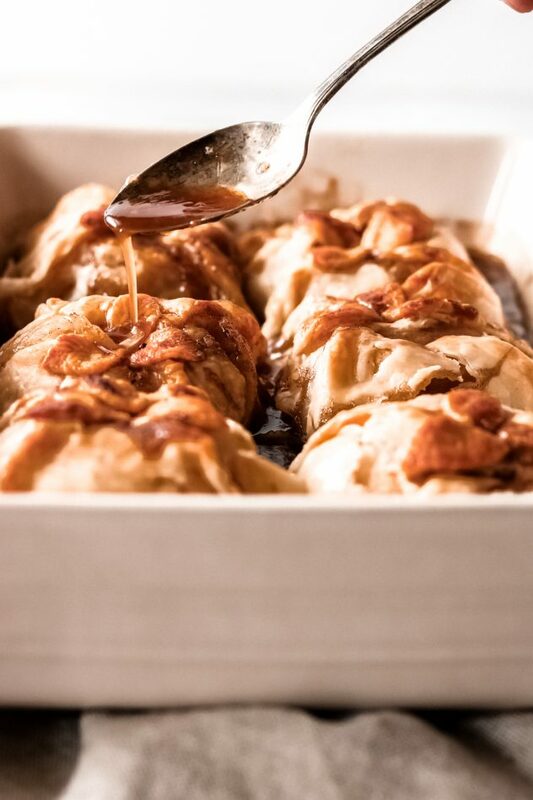 Begin assembling your apple dumplings. Place one apple in the center of one of your small square pie crust pieces. Place 1/4 tbsp butter down into the core of the apple. Then, spoon 2 tsp. of the cinnamon and sugar mixture into the core of the apple. Next, grab the opposite end corners of the square and pull them up to meet on the top of the apple. Pinch to seel the corners together. Do the same with the other opposite corners, bringing them up to meet on the top of the apple and pinch to seel together. Using your fingers, pinch the dough together down the sides of the apples so that the apple is fully enclosed in the pie crust dough. 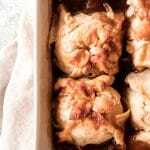 Place into a 9×13 baking dish and repeat this process with the remaining apples. In a saucepan, add the brown sugar, water, 1/2 tsp of cinnamon, and 3 tbsp of butter. Heat on medium, stirring occasionally, until everything is melted and combined. Pour over apples in the baking dish. Bake for 45-50 minutes or until the pie crust is golden and flaky. If you’d like, you can baste the apples with sauce mid-baking.